The Litestar was built in California (USA) in 1983 by Tomorrow Corporation. Designed by James. R. Bede (a world renown aeronautical engineer) the vehicle had an extremely low air drag factor of 0.92 and so along with a weight of 820lbs was capable of 100 miles per gallon at 55 mph and 73 miles per gallon at 100 mph. (Top speed 140mph) Powered by a 700cc V twin liquid cooled shaft drive motorcycle engine the Litestar has a tubular steel frame with double roll bars. Entrance to the vehicle was by means of a canopy which rolled back to allow access from the top. It could seat two people with the passenger sitting behind the driver. 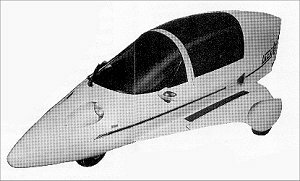 The vehicle could be driven with the canopy in the retracted position for “convertible operation”.